One of the best things a manufacturer can do to prove a car’s worth is to race it. Keep it mostly stock to demonstrate its capabilities. Unfortunately, Toyota discovered something they shouldn’t have kept close to stock on their rally-prepped 2016 Toyota RAV4 at the Gorman Ridge Rally: the car alarm. 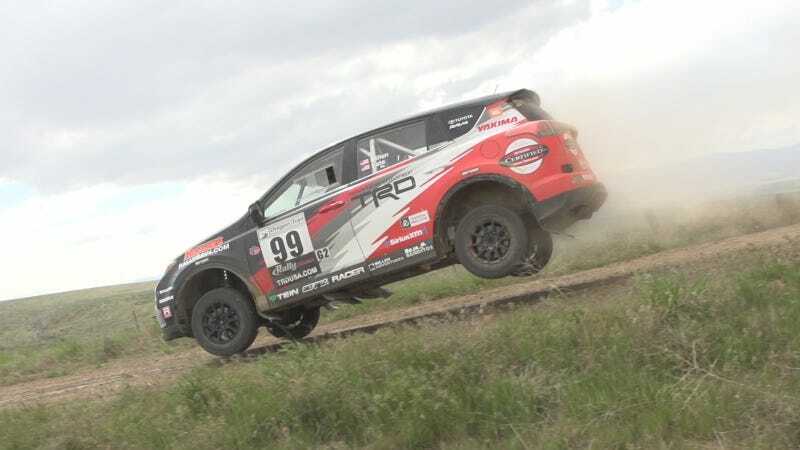 Driver Ryan Millen and co-driver Christina Fate had taken an alternate RAV4 to Gorman Ridge to test out, according to Rallynotes. This car was originally intended for showroom displays, but instead of faking it, Toyota just built another race car. Given that the only big changes were adding safety items, tweaking the suspension and swapping tires, that wasn’t hard to do. After completing four stages in the RAV4, it wouldn’t start back up. The RAV4 got stuck in the rally’s service park because its theft deterrent system thought the car was being stolen and disabled the car accordingly. It likely detected that the steering column had been tampered with in the process of removing the airbags and steering column lock to prepare it for racing, Rallynotes noted. Switches and sensors are so integrated into the car now that it’s become impossible just to swap an ECU out to disable theft deterrents and other systems. The car’s CAN BUS network looks for specific digital signatures on components and won’t let the car work if switches and sensors aren’t coded to work with the system. Did you dig into the steering column to fabricate a roll cage and add a racing wheel? Too bad, won’t start. The level of integration now present in a vehicle’s electrical components and the proprietary nature of programming these systems to work is especially bad for grassroots racers and privateers, given that many manufacturers prefer keeping their technology fairly locked down and unavailable to the public. Such is the state of automotive technology in 2016 that a technical issue with a car alarm can grind even Toyota’s own rally program to a frustrating halt. Don’t bin those old Imprezas just yet, folks.